al|together 2008 Day 6: LEAVEs. al|together 2008 Day 5: May Sky. al|together 2008 Day 4: Moonshine. al|together 2008 Day 3: The Letter. al|together 2008 Day 2: Crimsoness. al|together 2008 Day 1: From the Bottom of the Heart. When hysterical masses made light of your plans? Rise and show me the work of your hands. The silent strain of sad good-byes. al|together 2006 has come to a close. We are proud to present the insani five -- our contribution to the second season of this festival. Polyphonica: il mondo in Commedia maggiore e minore demo release. Our deliberations on the fate of our Wind patch are over. We have voted to have a one-month test period, at the end of which our patch will be released publicly. We did this because we felt, finally, that there was no other fair way for those few who had bought the game in the hopes of playing our patch to obtain that which they deserve -- and that a private distribution method would miss some of these people. Congratulations to NNL on their release of their Retail Edition translation patch for Wind -a breath of heart-. The Space Between 〜White Labyrinth〜 demo release. I didn't go to the moon, I went much further -- for time is the longest distance between two places. Welcome to the World of Insanity. Save the Last Dance for me. The air that passed for brains when wretches translated. A Midsummer Day's Resonance and The Poor Little Bird project pages up. Ever wonder what hackers bored medical students do for light (?) relief? Why, we translate stuff, of course! In this case, the victim subject is ... well ... why not find out for yourself (with apologies to Haeleth, of course ...)? nscripter.insani.org -- subvert the dominant paradigm, pick up an NScripter-based game, and start translating today. "When open-source and eroge take over the world, they will start the calendar from the Hanihani demo release, H-day. ;-)"
The Projects page, as well as the individual project pages, has been standardized to a new and improved (well, slightly) layout specification. We made up some CDs to hand out at AnimeBoston last week, but ended up with some leftovers. So if you want to check out our game adaptations but can't download them, we'll be happy to mail you a CD, free of charge. It contains all our releases except for Majipuri (too big to fit). Just send an email to democd-at-insani-dot-org with your mailing address, and we'll ship one off to you. Note that there's nothing fancy or exclusive on the CD, so if you can download our releases through BitTorrent or IRC, please let the poor dialup and corporate-firewalled users have the first crack at the limited stock of leftover discs. Thanks. 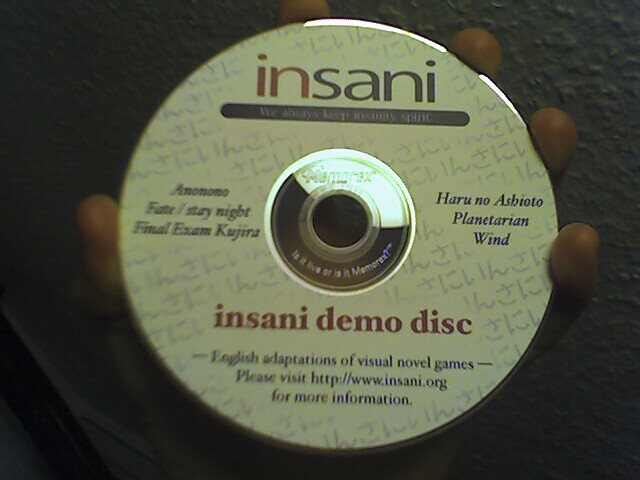 Final Examination Kujira demo release. Final Examination Kujira project page up. Planetarian Retail Edition English patch release. The subtitled versions of both the preview and the retail OP video for Fate are now available. Planetarian demo release. Happy holidays from all of us here at insani. The (subtitled!) Majipuri OP video is now available as a standalone torrent. By group consensus, the Wind translation will be distributed as a patch, and we will not seek to contact minori at present. However, should minori contact us to cease and desist, we will do so. In other news, Wind Re:gratitude will be released on 11.05.04. This is a re-release of the original game on a DVD (none of the DC- or PS2-specific scenarios or new CG have been added), along with the fandisc "Soyokaze no Okurimono" and "Rustle〜Wind Original Soundtrack〜". If you plan on playing our translation patch, and if you haven't yet bought a copy of the game because it has been out of print up until now, we urge you to buy a copy now. At this point, the Wind translation project is nearing final first-draft translation completion. It is late in the game, but we are currently thinking about contacting minori to ask them for permission to distribute a translation patch. A vote on this matter is in progress amongst the dev team. Check back later for more news. The Wind project lives. Kind of. Format of individual project pages changed. Fate/stay night project page up. About Us page completed. Website now fully operational. Stay tuned ... to A=441, if you please. Haru no Ashioto demo release. Site is now live. Haru no Ashioto project page up. Now, About Us is the only section left to finish. Wind project page up. It is now by far the largest-size file in our entire website, graphic files included! Projects and FAQ and Links up. More to follow. This is the final iteration of the test css. At this point segmentation into SHTML has begun, and work on the various sections has begun. Expect to see the About Us and FAQ sections soon. This is the first iteration of the test css for the insani.org website. As you can see, the design has not yet been finalized, so please bear with us as we tinker. At this point the segmentation into SHTML has not occured yet, and we're still debating what to do about the logo. The "Quotes of the Update" section will double as submenu space for the individual projects in their respective sections. This site will go live with the release of the Haru no Ashioto demo. "So, nominations for festival subtitle?" "Choad chunk chow defendentam vim3 donde esta el baño?" "*sigh* 'Cross the Rubicon' it is."